Author's Note: This story was inspired by the photograph shown above and ended up expanding into a series of short stories. It was the squirrel that made us realize he wasn't an ordinary child. Actually, I need to correct myself. There wasn't much that could be called ordinary about this kid. It all began on a mission. The mission started with we four members of SG-1 all healthy and perfectly normal – as normal as any of us could be considered, that is. The way it ended, however, was something else entirely. The description of normal and healthy still applied to three of us. As for the fourth . . . not so much. Healthy, yes, at least according to Fraiser. As for normal, there was nothing at all normal about Doctor Daniel Jackson having been reduced to the age of four years old. And we had no idea how it happened since he was alone at the time and had no memory of the incident – nor of his entire adult life. It was as if time had been reversed, and Daniel was as he had been back in the year of 1969. It had taken a lot of talking to calm Daniel down. As far as he was concerned, he should have been in Egypt with his parents. In the end, it was Carter who decided to tell him the truth. Danny took it quite well for a four-year-old. But then, considering who he was, I suppose that's not surprising. It didn't take us long to see that Daniel's intelligence and ability to accept extraordinary concepts with relative ease manifested at a very early age. A panicked call to the Asgard resulted in Thor coming to see what mess Daniel had gotten himself into this time. He thought the whole thing was extremely fascinating. That's not the word I'd have used. After running Daniel through some scans, he determined that our archeologist would not remain a child for long. He was aging at the rate of around one year every four days, which meant that he'd be back to his correct age in around four and a half months, give or take, a big relief to all of us. I mean, he was an adorable kid, but we all wanted the adult version back. Thor also assured us that all of Daniel's memories would return as well. They weren't gone, just repressed and seemed to be filtering back into his conscious mind in sync with his aging. And so began our little adventure in the care and feeding of a downsized Daniel Jackson. You parents out there think it's tough keeping your kids in clothes? Try clothing a child who's growing so fast that you can actually see it happen if you stare at him long enough. We ended up taking a trip to Goodwill and buying stuff for boys of every age. The woman behind the cash register gave us rather an odd look. The thing with Daniel's memories made it pretty tough on the poor little guy. Every hour of every day, he was regaining memories of his life with his parents, yet he was here with us, not living that life his memories were saying he should be. We were all dreading the moment he'd regain the memories of that certain day when he was eight years old. Fraiser was already planning on sedating him when it happened. In the meantime, Carter and I were determined to pack as much fun into Daniel's life as possible. Unfortunately, we were limited on where we were allowed to take him. If it had been up to certain individuals, Danny would have been kept inside the mountain every second of the day. Hammond, bless his big Texan heart, agreed that would be no life for a child, regardless of whom that child was. So, we were allowed to take Daniel to various places in the area, though we were limited to how long we could stay in any one place. We weren't the only ones who might notice how fast Daniel was growing. And then there were the "incidents," little – and some not so little – events that took place. First, there was the Commissary Incident in which a boisterous Daniel accidentally caused Colonel Dixon of SG-13 to drop his food tray. Danny was horrified and looked like he was about to burst into tears. Dixon, who was never shy about complaining about his own brood of kids, surprised us all by scooping Danny up, giving him a hug, and telling him it was okay. Next came the Dizzy Danny Incident. While the rest of us were all in the briefing room talking with the general, Danny was in Hammond's office. He'd discovered how fun that big, cushy office chair could be and was spinning around, and around, and around in it. Well, his stomach, which had just enjoyed a big lunch, did not enjoy the ride and chose to eject the aforementioned lunch all over the floor. I mentioned before about Hammond's big Texan heart, right? Well, he gathered up the crying little boy and just rocked him in his arms until Danny fell asleep. I have never been more honored to be under that man's command. Of the incidents so far, my personal favorite is the Kinsey Incident. Senator Kinsey decided to drop by, apparently for no other reason than to be a jackass. Personally, I believe he thought he'd derive some satisfaction from seeing Daniel having been 'humbled' to the age of a young child. It didn't quite work out that way. After studying the man for around five minutes, our Danny Boy boldly declared, "I don't like you. You're mean." Kinsey didn't find the humor in it. The rest of us thought it was hilarious, not to mention completely true, and took Danny out for a big ice cream sundae as a reward. And, now, we come to the Squirrel Incident. We took Danny out for a day in the woods. He was around five years old now, all dressed up nice and warm in a green coat to keep out the autumn chill. Carter thought he was just the cutest thing ever, tossing up piles of dead leaves, dangling from the limbs of trees, just being a happy, energetic five-year-old. Okay, so I admit it. I thought he was cute, too . . . and if you breathe a word of that to Daniel once he's an adult again, I will use my Special Forces training to track you down and kill you. As we made our way down the path, we'd seen several squirrels, all of which ran away upon our approach. These were not the semi-tame things you saw in the city parks that liked to beg for food from the picnickers. Danny was a good twenty yards ahead of us when he saw a squirrel sitting in the middle of the path, munching on something, most likely a nut. Very slowly, he approached the squirrel, which stopped eating and just watched him. We all expected it to run away as soon as Danny got too close. It didn't. He walked right up to it, knelt down, and held his little hand out to it in a gesture of friendship. The squirrel looked up at him for a moment, then amazingly, went right back to eating. Daniel had picked up a nut a few minutes earlier. He fished it out of his pocket and offered it to the squirrel. Incredibly, the little creature rested its paws on his hand and took it. Carter, Teal'c and I were all standing completely still, watching in amazement, almost holding our breath. Was this someone's pet squirrel that had gotten out or been set free? What other explanation could there be? A completely wild squirrel wouldn't act that way. It seemed to be totally unafraid of him. Once it finished the second nut, it searched Danny's hand for a third. Not finding one, it began looking around on the ground. At that point, we decided to approach. We hadn't even made it five yards when the squirrel looked at us, then ran away and darted up a tree. 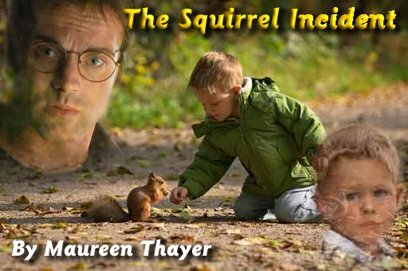 Logically, you could reason that three adult humans would be a lot scarier even to a tame squirrel than one little boy would be, but I had a funny feeling in my gut that there was more to it than that. The next day, I took Danny back to the woods, just the two of us, and I watched closely. As long and he and I were together, all the wildlife kept their distance, but whenever Danny was separated from me by at least fifty or sixty feet, the animals didn't seem to be bothered by his presence at all. They'd keep going about their business as if he was no more threatening than one of their own kind. Two birds going after insects let him sit and watch them from a mere three feet away, and a young doe allowed Danny to walk right up to her, though she moved away a bit when he tried to pet her. We have no idea what this means or the reason for it. Could it have something to do with a combination of Daniel's ascension and whatever happened to him on that mission? Fraiser has run a few more tests and found some unusual stuff going on with his brain, though she can't explain why it's happening. We're considering calling the Asgard again. Danny is now asleep in the bed in my quarters, his innocent little face peeking out from underneath the covers. It hurts a little to think about how much he reminds me of Charlie. The question on all of our minds is how this thing with the animals is going to impact the future. Is this something that will disappear as Daniel regains his lost years? If it does, we'll probably all just shrug and chalk it off as some weird temporary by-product of whatever caused Daniel to de-age. If not . . . I don't know. But, for now, we three adult members of SG-1 are having fun watching our teammate experience the joys of being a child again. We are all determined that, this time, Daniel's childhood will be a happy one, regardless of how short it's going to be. No dealing alone with the grief of his parents' death, no rejection from an uncaring grandfather, no foster care. He may have no choice but to remember all those sad and terrible things, but we're going to do all we can to make him feel like they are just the memories of another Daniel Jackson, that they are not his reality. We are his reality, me, Carter, Teal'c, Hammond, Fraiser, and all the other people here at the SGC who have let Daniel into their hearts. We will be his family and experience all the future "incidents" with him. I suspect that there are going to be some adventurous weeks ahead. THE END . . . until Part 2.